What will Oakland look like in the future? What developments are in the works? What are visions of the Oakland that we want to see? Will we have more gnomes? Will police misconduct ever end? Will we all have access to safe neighborhoods and educational opportunities and glorious libraries and community farms and hackerspaces on every corner? Are we going to be a diverse community that has a government that enables everyone to be a part of the process of determining what the future of our city will look like? West Oakland Urban Farm and Park - City Slicker Farms has begun work on a new kind of park/farm at the corner of 28th and Peralta St. in West Oakland. Choose - A mural at Youth UpRising depicting possible futures for the youth of Oakland. Check out lots of community proposals written right here on the wiki for what the future of Oakland could look like! Do all photos of planned stadia have to be dramatically drawn at night with lights all over the place??? 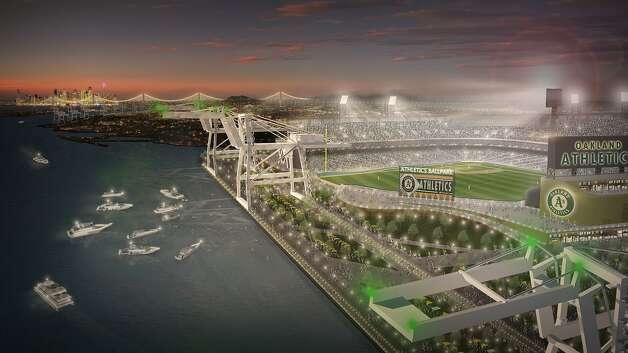 This one is a proposed A's stadium. [source]...now we've learned about Future Oakland, what about Unbuilt Oakland? Why does this page exist? There's something about the power of imagination...something about poetics..